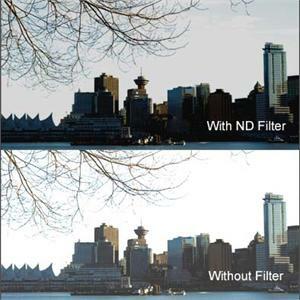 The neutral density filter reduces the amount of light entering the lens, without effecting colour. It is used primarily when the light level exceeds that which the film stock or video CCD can handle; this is often the case when shooting on a sunny day in a location featuring an abundance of light reflection such a desert, ocean or snowy landscape. If a reduction in depth of field is desired, the ND filter can help achieve this because it allows you to open the lens aperture further without changing exterior light levels.